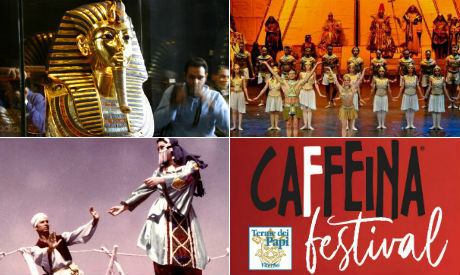 The Cairo Opera Ballet Company and the Reda Troupe for Folkloric Arts will give performances during Italy’s Caffeina 2018 festival, which will take place in the city of Viterbo from 22 June and 1 July. The ballet company will perform on 24 June and the Reda troupe on 30 June. The ten-day festival brings together music, theatre, writers and many artists from Italy and internationally. The event takes place at the medieval Palazzo dei Papi, a palace which served as the papal seat for 24 years in the 13th century. The Egyptian Treasures exhibition in Viterbo is being launched in parallel with the festival; it will open with the beginning of the festival on 24 June and will continue until 20 October. The exhibition will include over 50 Coptic icons as well as 250 reproductions of Egyptian archaeological treasures, including copies of the complete treasures of Tutankhamun's tomb. Numerous Egyptian figures will join the Egyptian artists during the festival, among them Ines Abdel-Dayem, the culture minister; Mostafa Waziri, the secretary-general of the Supreme Council of Antiquities; and Zahi Hawass, Egyptian archaeologist and former minister of state for antiquities affairs.